From preparing meals and entertaining friends to playing with the kids and sleeping, we spend a lot of time at home. So it goes without saying that it’s pretty important for your home to be a place that makes you happy. 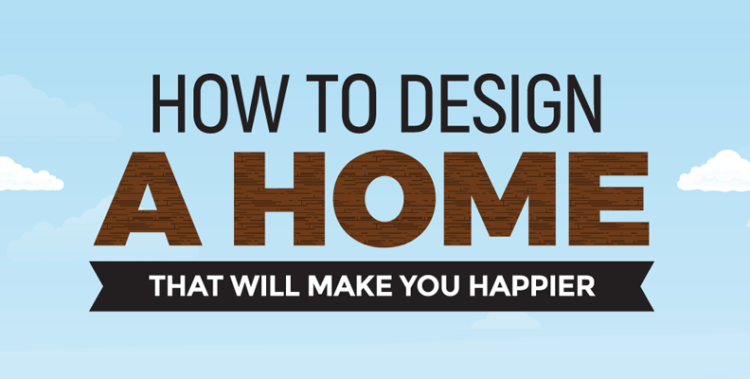 From the right use of color and plants to where you put your furniture, we’ve compiled the best tips and techniques to help you design a home that will keep you rested, inspired, healthy and – you guessed it – happy. 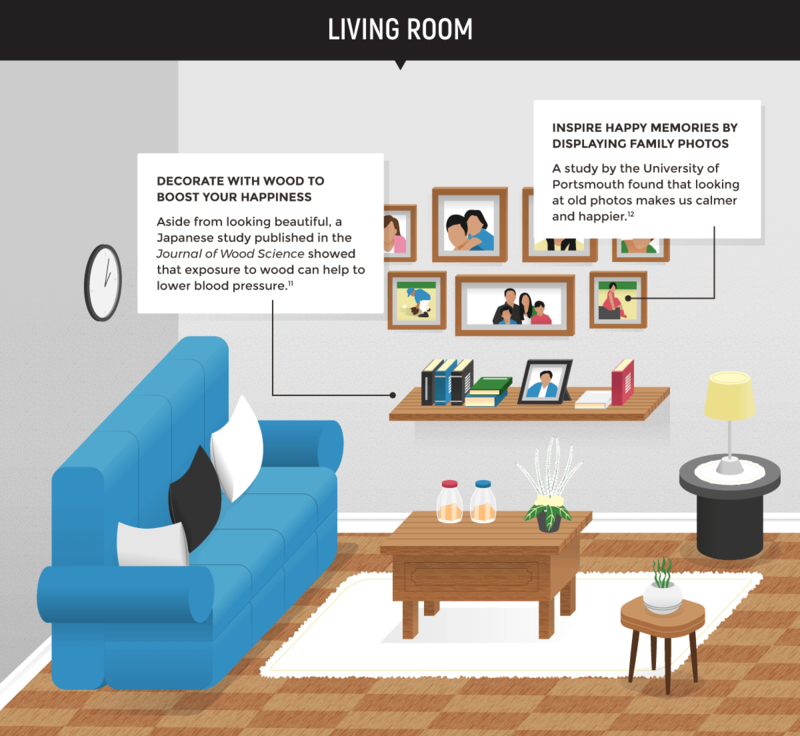 The living room is traditionally a space for families to come together to talk and watch TV. In the age of streaming and social media, you might need to work a bit harder to make it a place for everyone to enjoy. Choose wood floors and accents and adorn the walls with galleries of your favorite family moments, which create a calming atmosphere and give us a happiness boost. The heart of the family home, the kitchen is often where we spend most of our time together. They key to one that makes you happier? A design that helps bring you together and reminds you what you mean to each other. When you’re entertaining guests, you want your dining room to showcase the best of your home and help you and your friends have a great time. 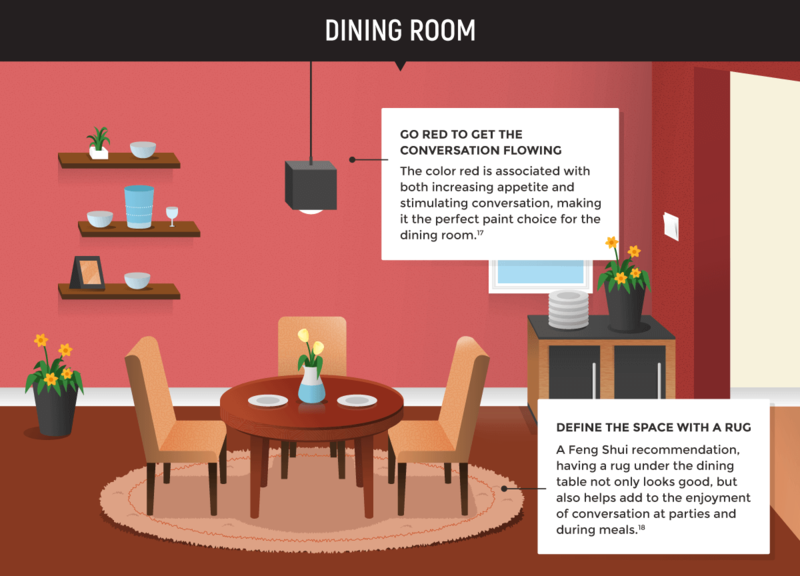 Find a fun area rug to help define the space and go for red walls, which science shows help stimulate conversation and appetite. It’s a win-win! 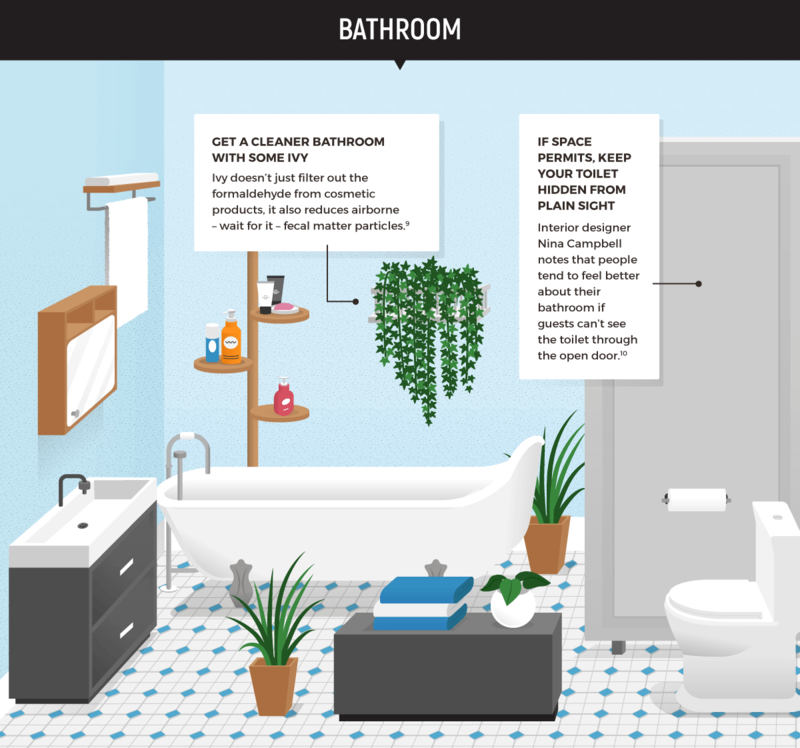 Your bathroom has two main functions: getting clean and, well, you know the other. To make it a happy space that you can be proud of, opt for plants that help clean the air (and freshen up the space) and try to hide that toilet from plain view. Of all the activities that take place in the bedroom, the primary focus is, of course, sleeping. 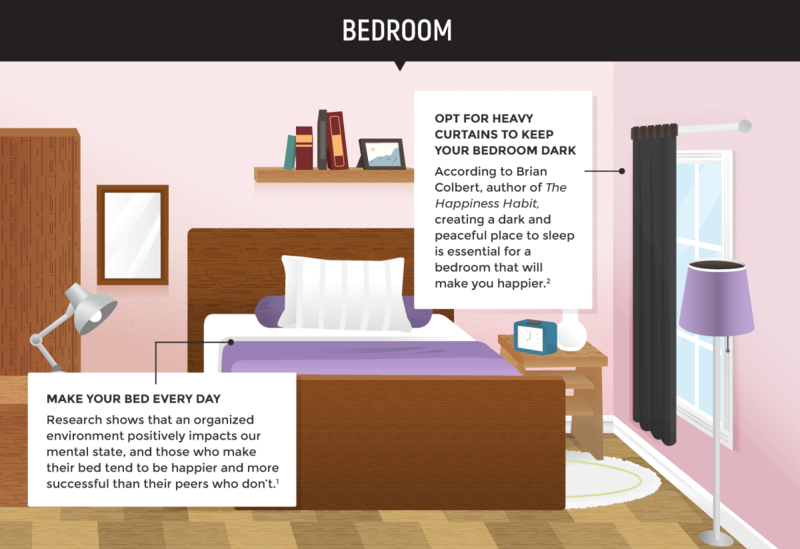 Getting plenty of sleep is essential for starting the day off right, so keep your bedroom nice and dark to ensure a peaceful slumber. In the morning, be sure to make your bed before jetting off. 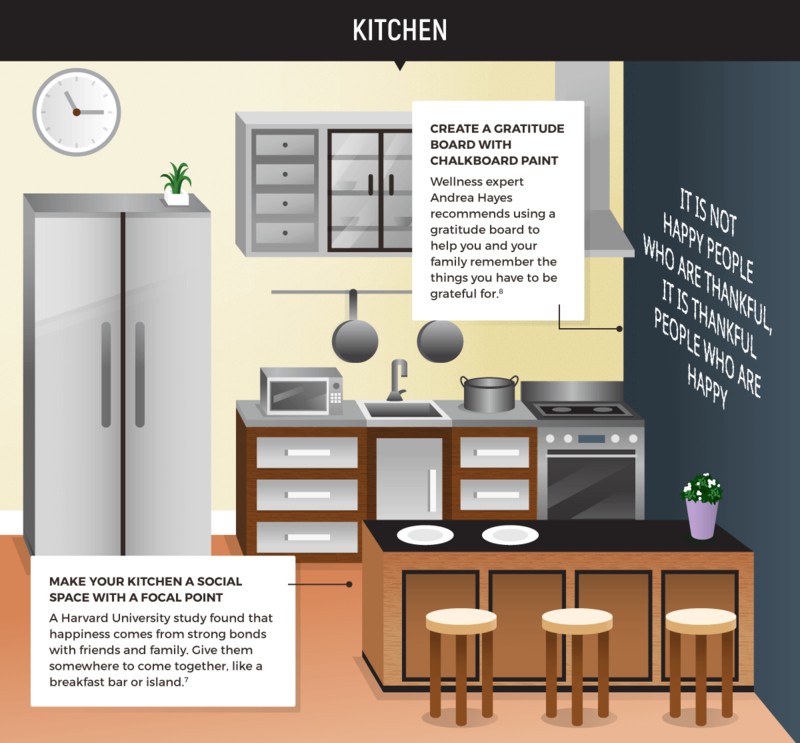 Research suggests that an organized environment makes us happier. 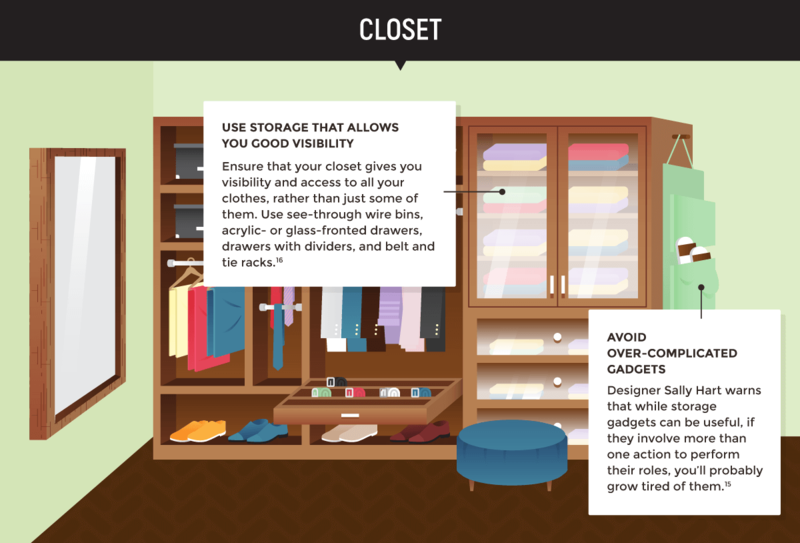 A walk-in closet can make your life easier, offering easy access to your entire wardrobe. But let it get out of hand and it can cause misery and frustration. Keep things happy and hassle-free by using see-through bins and drawers that keep everything visible. 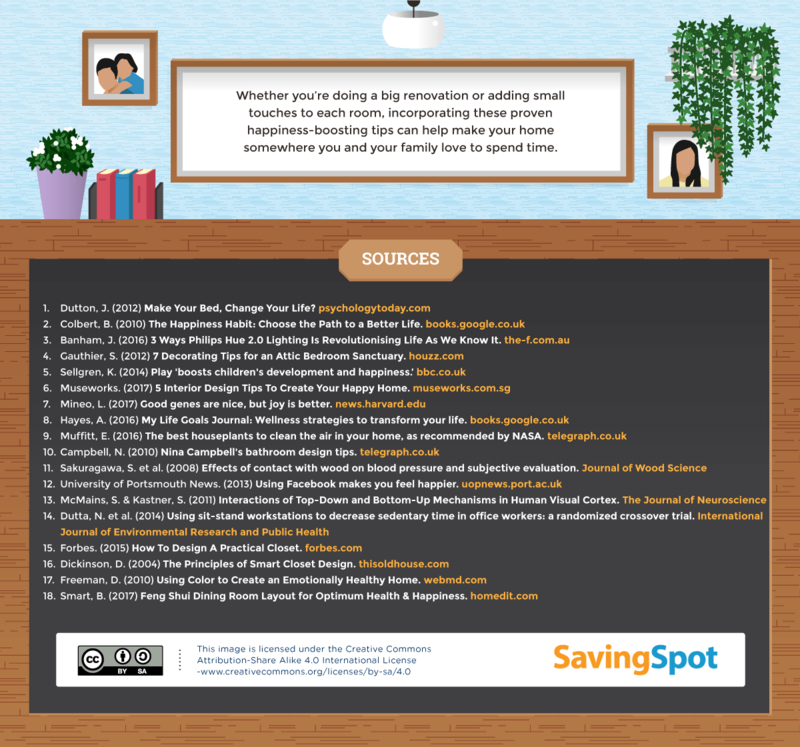 Whether you regularly work from there or not, your office should be a functional and pleasing space. A Princeton study found that we’re easily distracted by clutter, so invest in storage solutions that help keep it tidy. Research also shows that sitting for long periods is no good for us. 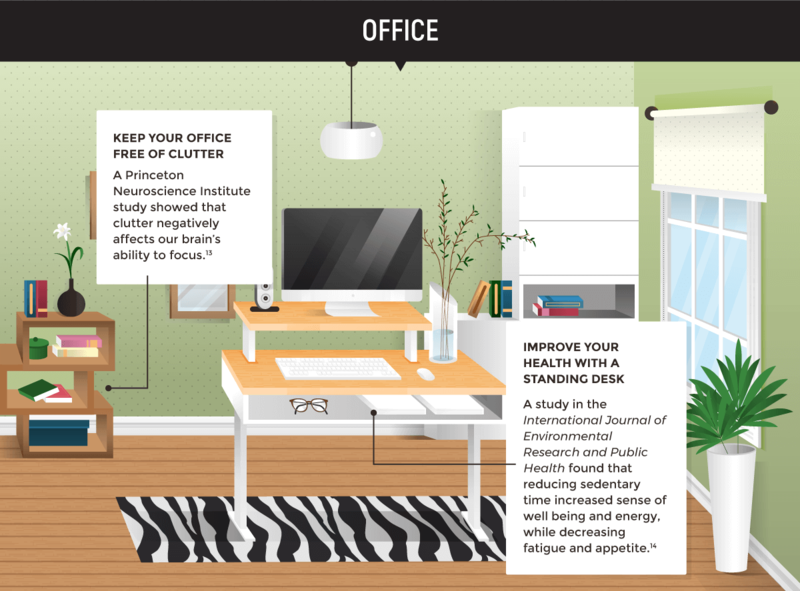 Opt for a standing desk to help give your energy (and your health) a lift. 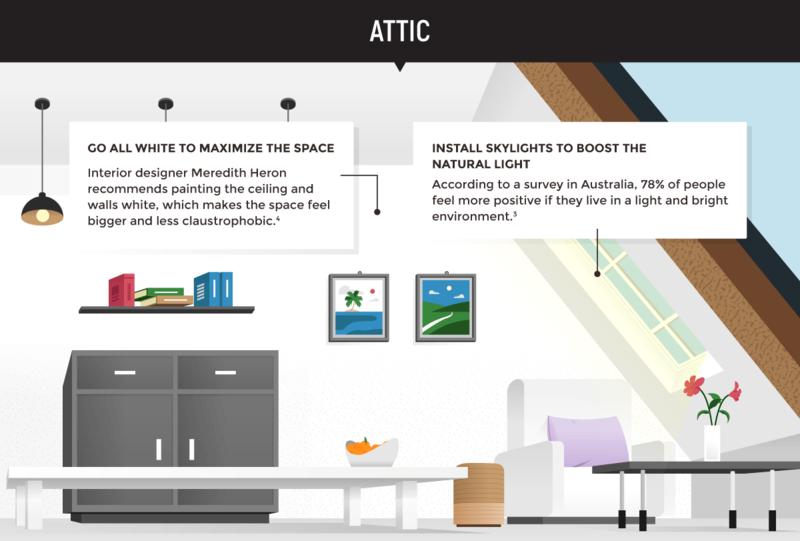 Many of us use the attic for extra storage, but it’s a great space for living, too. If you decide to convert it, make sure it’s bright and welcoming so you want to spend time there. Think big windows and white walls, which make the space feel more open. 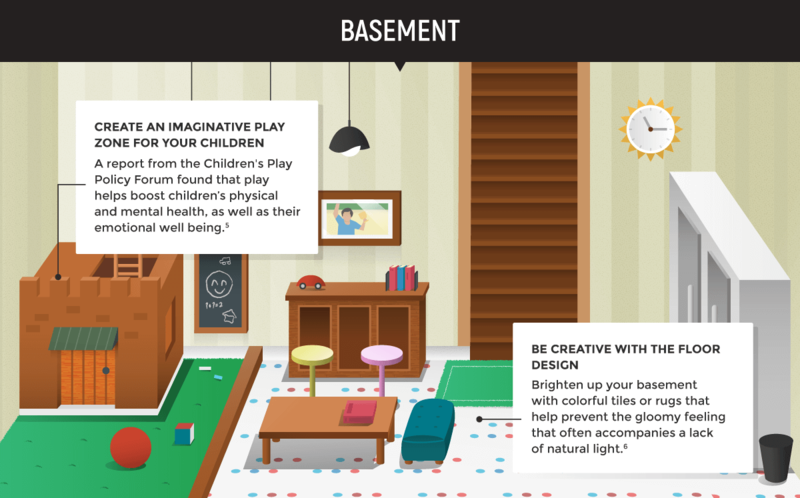 Basements are more than just storage areas with cold cellars – they’re unconventional spaces that offer you an opportunity to be creative with both design and decor. 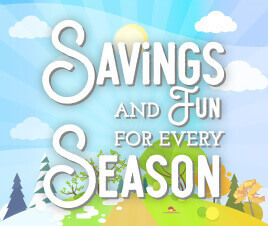 Whether it’s a playroom for your kids or a fun entertainment area, set a budget and let your imagination run wild. With this inspiration in mind, take a look around your home and see where you could make some changes. 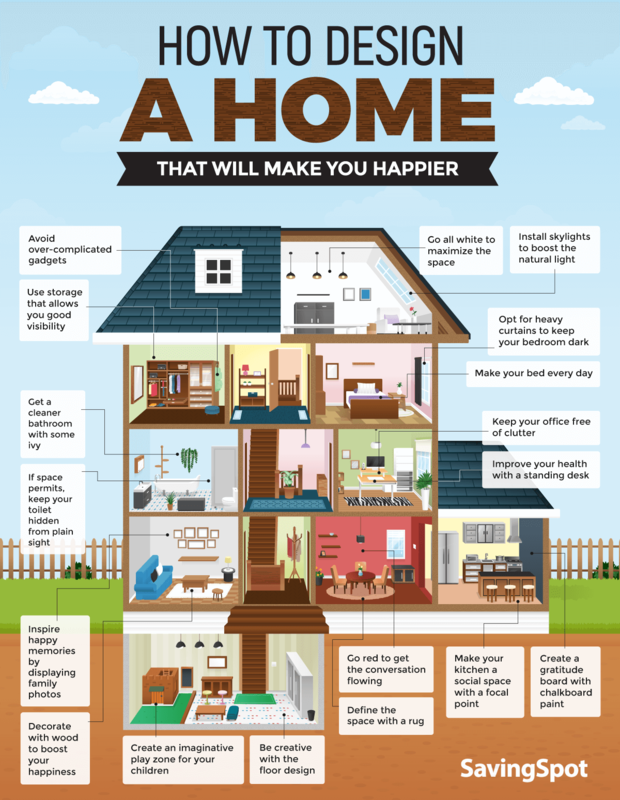 Your home should be your sanctuary, so spend time making it the happiness-boosting place you always wanted it to be.